From time to time, managerial positions become vacant—whether it is anticipated or not—leaving gaps in critical areas of the organization. Sometimes, internal resources can bridge the gap until a permanent replacement is identified and brought on board. However, often the level of expertise, skill needed, or time available to oversee the area is not available internally, and the best alternative is to engage an outside resource. Understanding each of these options will aid in choosing the right fit for your organization. 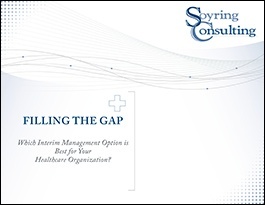 Soyring Consulting provides managerial and operational consulting services to healthcare facilities of all sizes, including For-profit, Not-for-profit, Community, University, and Faith-based facilities and systems. Our team has worked in 40 states across the US within all operational departments, as well as at the facility level or across an entire system.